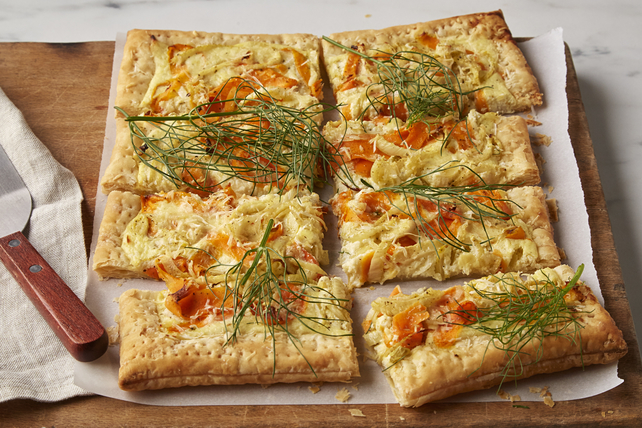 Place tasty veggies atop puff pastry and enjoy the rich flavours of this Roasted Fennel & Carrot Tart. This carrot tart variation is chock-full of flavour. Cut carrots crosswise in half, then use vegetable peeler to cut carrot pieces into thin lengthwise slices. Cut fennel into thin slices, then chop coarsely. Place vegetables in large bowl. Add garlic and 2 Tbsp. dressing; mix lightly. Bake 20 min. or until vegetables are tender. Unfold pastry sheet on separate baking sheet sprayed with cooking spray; prick evenly with fork. Bake 10 min. ; cool slightly. Mix egg, ricotta, 1/4 cup Parmesan and remaining dressing until blended; spread onto pastry crust to within 1/2 inch of edges. Top with vegetables; sprinkle with remaining Parmesan. Bake 20 to 25 min. or until edges of crust are golden brown. The flavours of this vegetable tart pair well with a mixed greens salad. Set your mandoline on the thinnest slice setting to quickly and easily slice the carrots, fennel and garlic.